I made this cake for D’s birthday which falls on last Friday. I learnt from my mistake last year that I should not rush for the cake and bake it only last minute. This year I planned in advance and took my time to complete the cake including making my own sweetened azuki bean (refer here for the recipe). I cooked the sweetened azuki bean on Monday night, baked the sponge cake base on Wednesday night, assembled on Thursday night and finally had the cake cut on Friday night. The cake turned out to be quite close to what I had in my mind except the garnishing on top. Even though I had mixed the matcha powder with snow powder, the matcha powder on top still dampened, anyone can advise me how to prevent it? I used double amount of the sweetened azuki bean, this was wrong too! 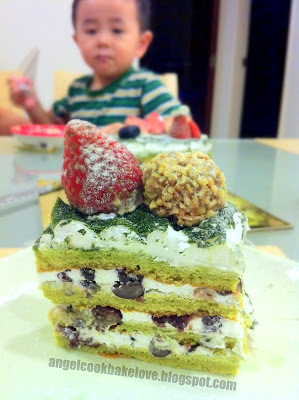 The cake became too sweet to our liking even though I had cut down the sugar amount in the matcha sponge cake. 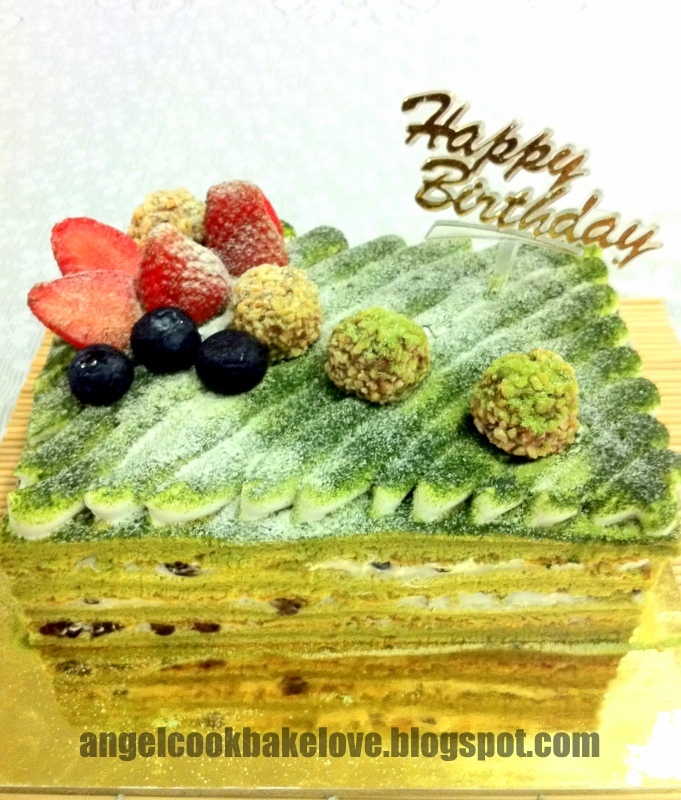 I highly recommend the matcha sponge cake, it is ultra soft and moist. I am sure it is good for swiss roll also. The texture of the sponge base is somewhat like 黄金蛋糕 (golden cake) if you have ever tasted one. 1) Heat butter and milk up to 50C (when touched it is slightly warm). Remove from heat. 2) Add sifted flour, matcha powder and baking powder. Mix well (your action must be fast and keep stirring else the batter may become lumpy). Stir in egg yolk one by one, mix well before each addition. 3) In a separate bowl, beat egg whites and sugar till soft peak form. Fold 1/3 of the meringue to the egg yolk mixture, mix well. Pour the mixture to the remaining meringue, fold in well till just incorporated. 4) Pour the batter into 14”x14” baking tray (mine is 12”x16”) lined with parcement paper. Smooth the top. Bake at 180C for 15 mins or until done. 5) To make syrup, heat up the sugar and water till sugar dissolved and set aside to cool down. 6) To assemble, cut the cake into 4pcs equally. Brush each piece of cake with syrup on both sides (this is to keep the cake moist, you may skip this if the cake is served on the same day). Place one piece of cake on cake board, spread thin layer of whipping cream and add some sweetened azuki bean, place another piece of cake on top. Repeat the same. Frost the top layer with more whipping cream (I piped lines with a plain round nozzle) and dust with matcha / snow powder. Chill before serving. To serve, leave the cake in room temperature for about 2-3 mins before serving. To make the cake more presentable, trim the four sides after frosting. I am submitting this post to Aspiring Bakers #18 : Layers of Love (April 2012) hosted by Sam of Sweet Samsations. Happy Belated Birthday to your D ! Beautiful Birthday cake! this is such a lovely cake, i hv been looking for the recipe. thanks for sharing it! I really love your layout of your cake. It looks really pretty in the picture, and also with the layers of red bean in between. Maybe reduce the sweetness in the red bean next time? Maybe if you chill the cake with the cream before dusting with matcha powder and serve immediately, it won't be so damp? 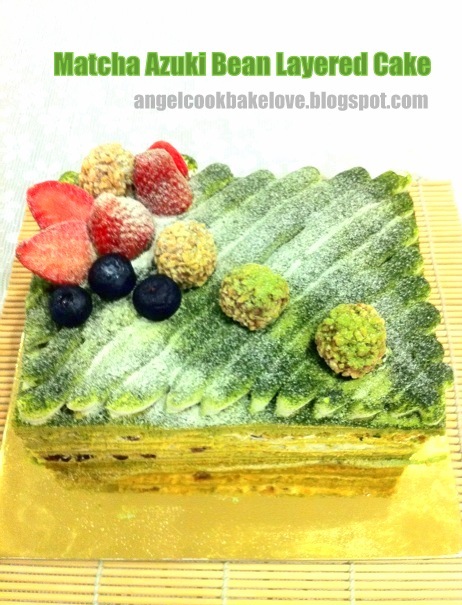 Or dust with icing sugar first, then dust with matcha icing mixture? How terrific! Love the matcha flavour! Thanks for your submission, Angel! :D I knew it would turn out just perfect! Hmm.... will dusting the cake with some snow powder or cornstarch first (act like a barrier), then only dust with matcha powder? I'm not sure if that will work. But then, it's a very nice looking cake to me, although I'm not a big fan of anything matcha. I actually didn't plan in advance for the layout, just gather whatever I could find in my fridge to play around. Thanks. Thanks for the precious advices. I think I will try your method to dust the snow powder first next time if I were to make it again. Thanks for dropping by my blog and your lovely comment. And, again, thanks for hosting April AB, the roundup is terrific, I kept on having "wow" when I browsed thru the roundup. 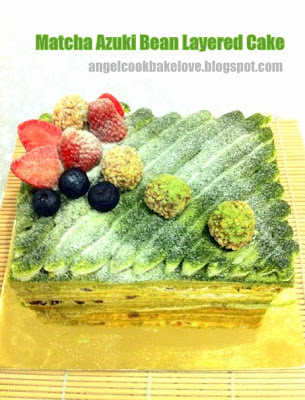 I love matcha anything so I must KIV this recipe and try making this cake for me. Lovely cake, good job. Wow,this cake is so pretty! I can see that you've put in lots of love in there & now wonder it looks so pretty & special! Thanks of your lovely comments.